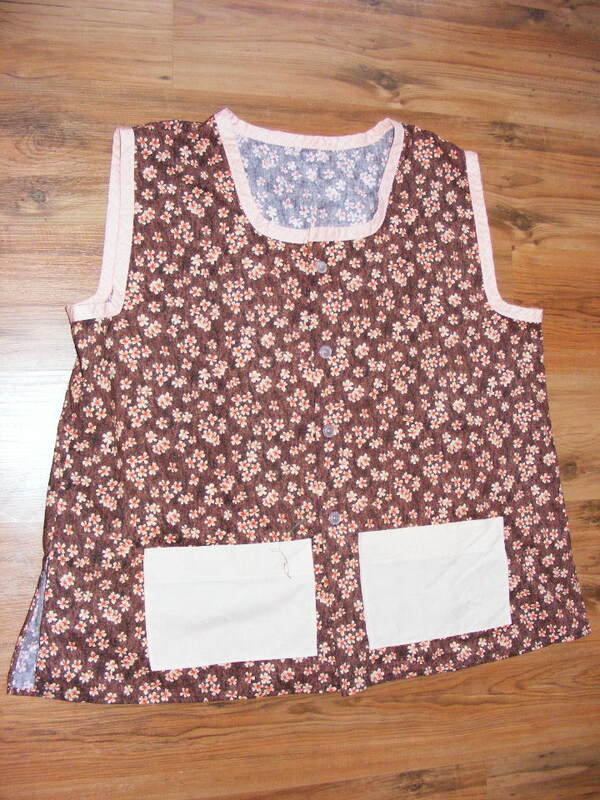 Before the holidays, I ordered several apron patterns from Indygo Junction. I used the patterns to make Christmas gifts and of course, I had to make a few for myself. First I made the Bon Appetit pattern. 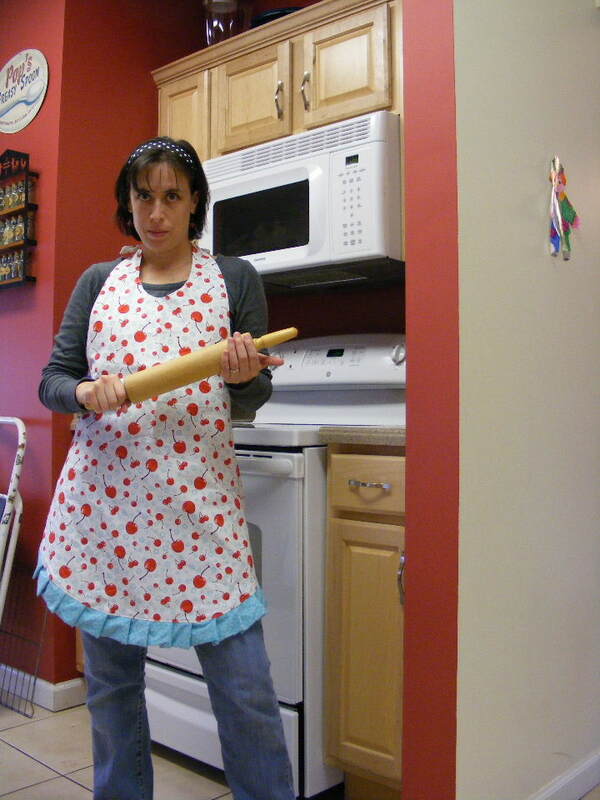 It was very easy to use and resulted in a very flattering apron. My only complaint is that the ruffle was too long and had to be cut after sewing it to the apron. It was a little confusing to understand the instructions. and I’m not sure the reasoning behind the excess in the pattern, but I just made the ruffle a few inches shorter after the first apron. 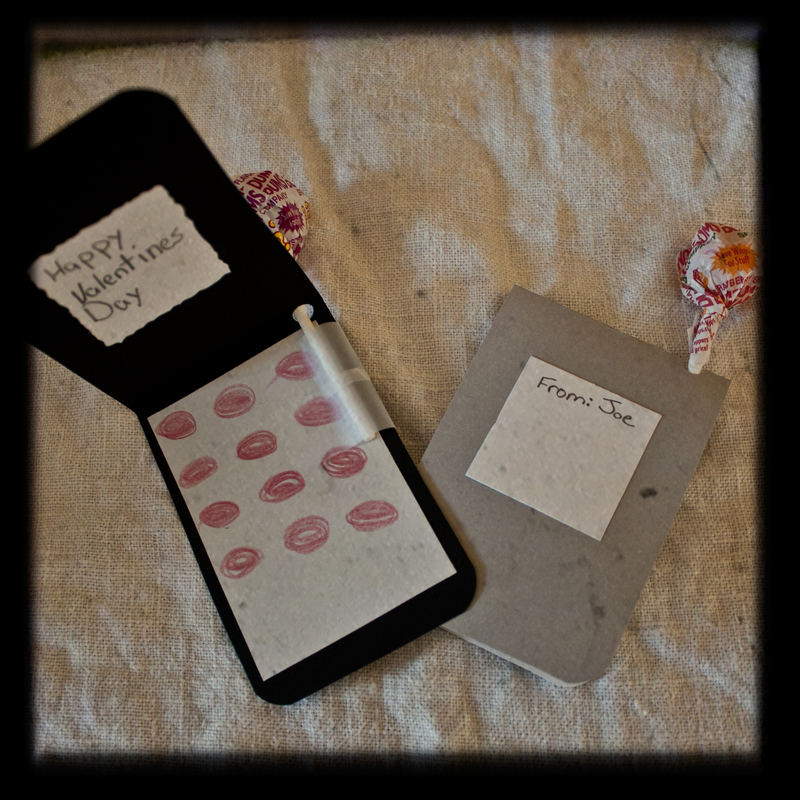 Several of these went out as gifts and were very well recieved. 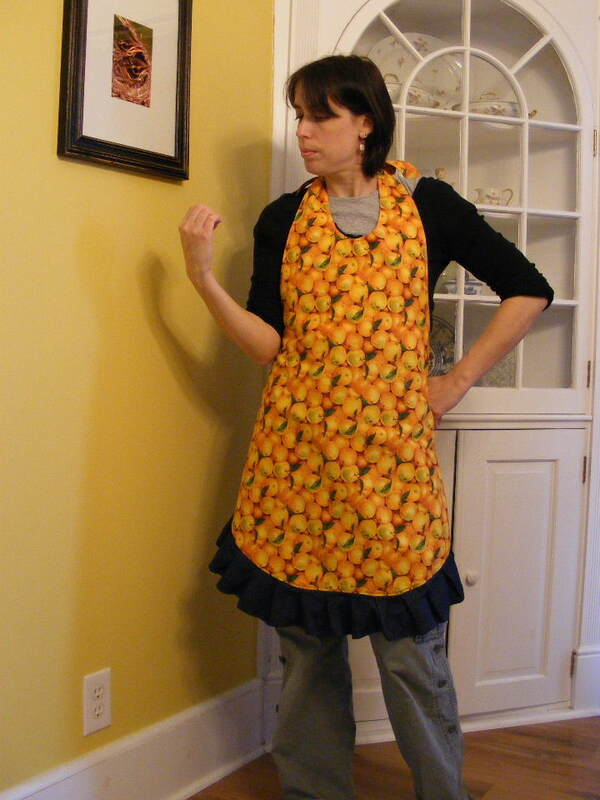 Bon Appetit Apron made with Orange fabric by Kaufmann I believe and denim. 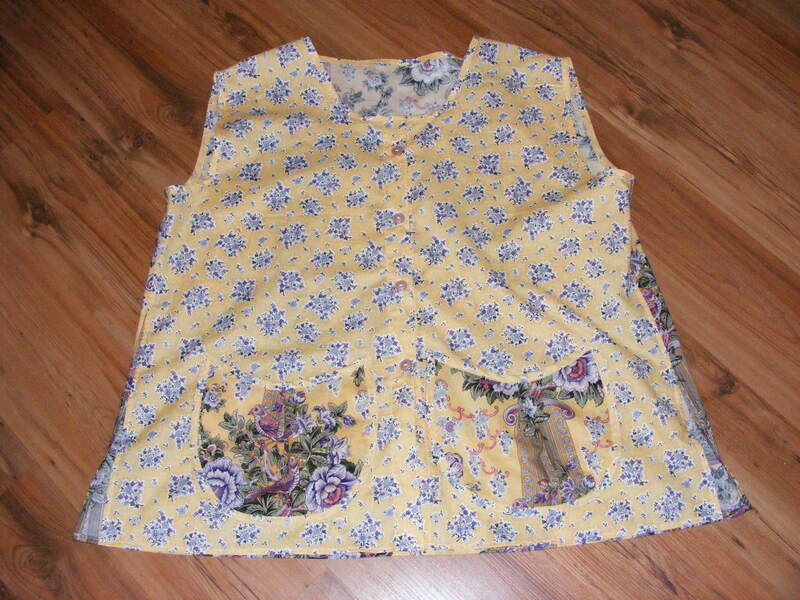 I also made the Afternoon Tea apron, and this one went together very easily. My only suggestion is to try on the apron and adjust the placement of the back as needed before you sew it all together. I had to take off several inches so it fit properly. I didn’t use this one for gifts since they needed to be fitted and I wasn’t sure of everyone’s size. 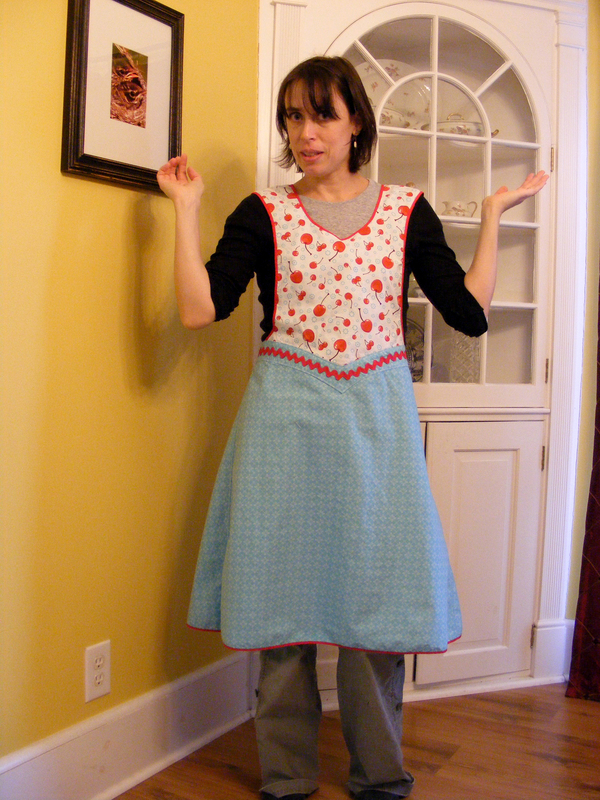 But, I made one for myself and this is one of my favorite aprons. 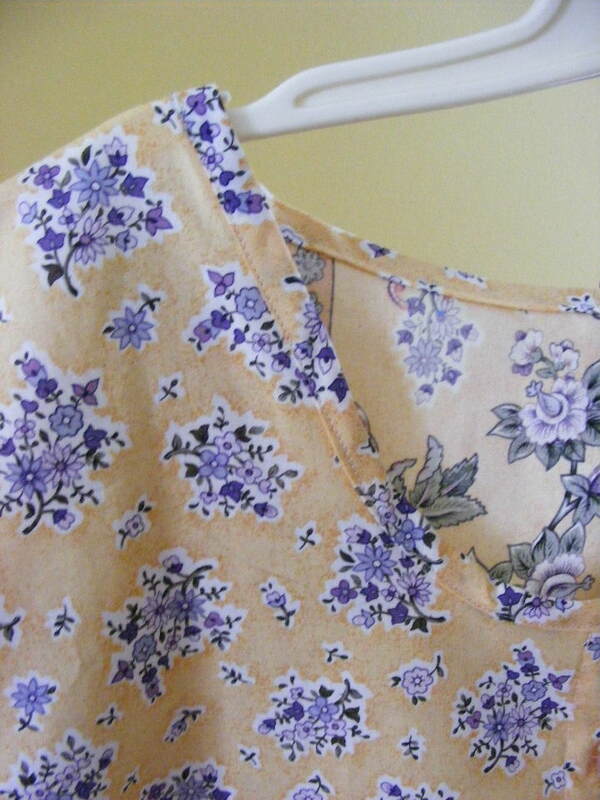 Finally, I made my grandmother the Mock Smock. She loves smocks. In fact, I’ve rarely seen her without one on, so I thought she would like a nice one made with designer fabric. The Mock Smock pattern was a little different then the ones she normally wears with the square shape to everything, but I liked the variation as it was pictured. However, I am not a fan of the Mock Smock pattern. I found the squareness of the arms and neckline very hard to work with. And the instructions provided were not much help. My first smock was a disaster. First I tried using the cut pattern pieces for the neck and armholes, but I couldn’t get the corners sharp and pretty. Then I took that off and tried rounding all the corners and using bias trim, but that didn’t turn out too well either. And for some reason, the neckline didn’t match up. So, I went back and made a few adjustments to the pattern. I rounded the sleeves and neckline. I also rounded the pockets and added a pleat to them. And I finished the pockets, arm holes and neckline with coordinating bias trim. I think this one turned out much better! And Gram loves her new smock. But she says it will be her special occasion smock, as it is much too pretty to wear everyday. 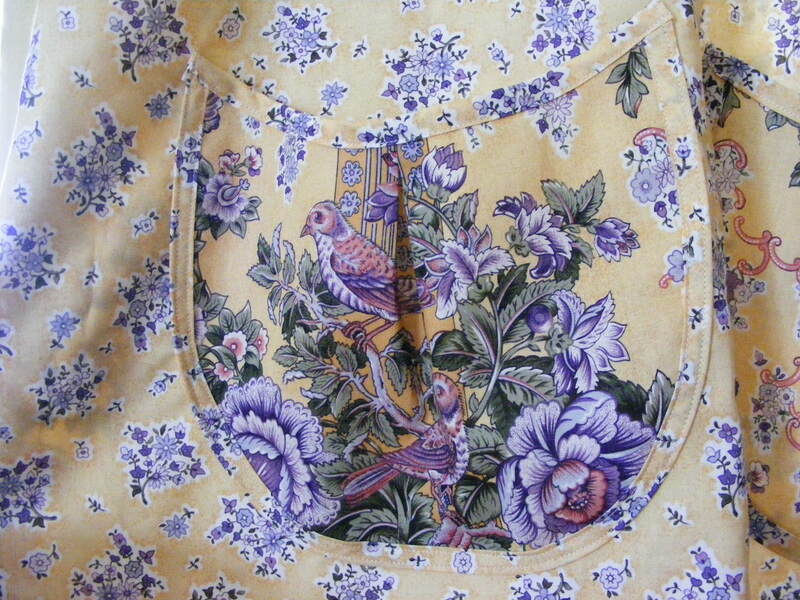 Mock Smock made with Birds of Paradise fabric by Free Spirit. I always have a hard time starting new things, hence the delay in starting this blog up. Even though I’ve kept two blogs successfully and consistently updated for over 3 years now, this particular blog is new and therefore, I am having the problem of getting started. I think it is especially hard because there are so many things rumbling around in my brain right now. 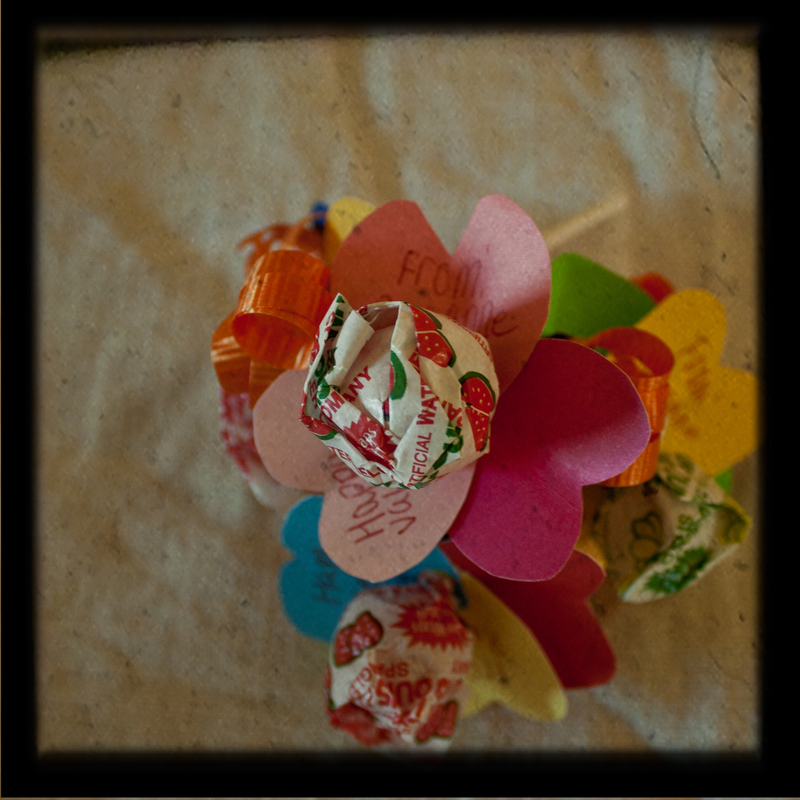 Since it is the holiday season, I will start with this craft project I just finished up that would make a great gift. The black things are the bumpons in case your were wondering. Cut you photo into a 4 x 4 square. 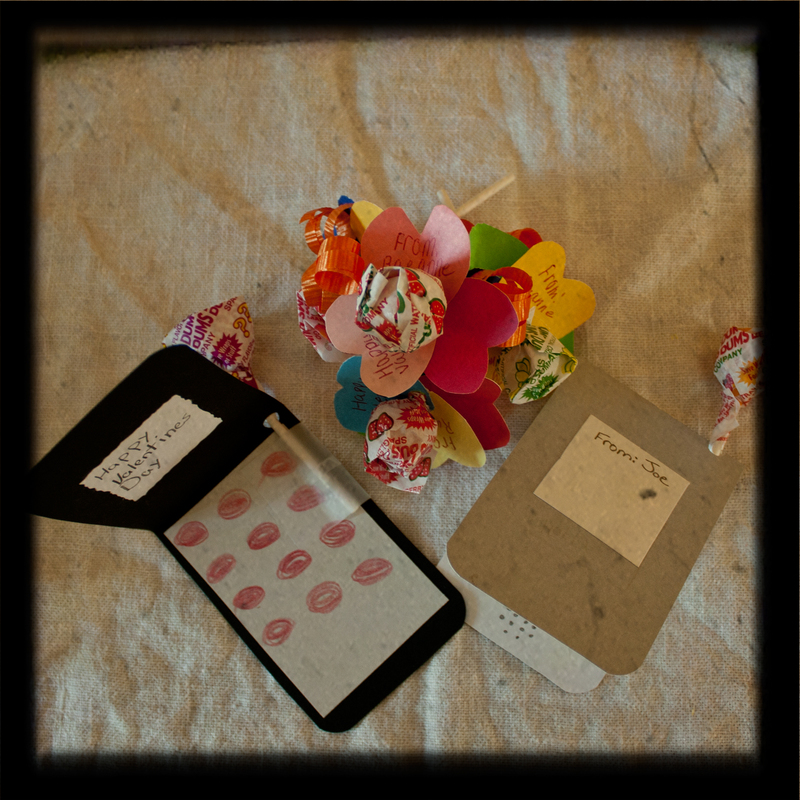 Place the photo or paper on your tile and smooth out any bubbles. Be careful not to get glue on the paper. I like to use a bone burnishing tool and a damp rag for this job. Once the glue is dry, check to make sure the corners of the photo are stuck down. They might need a little glue at the corners. You can apply a few drops with a toothpick if needed. 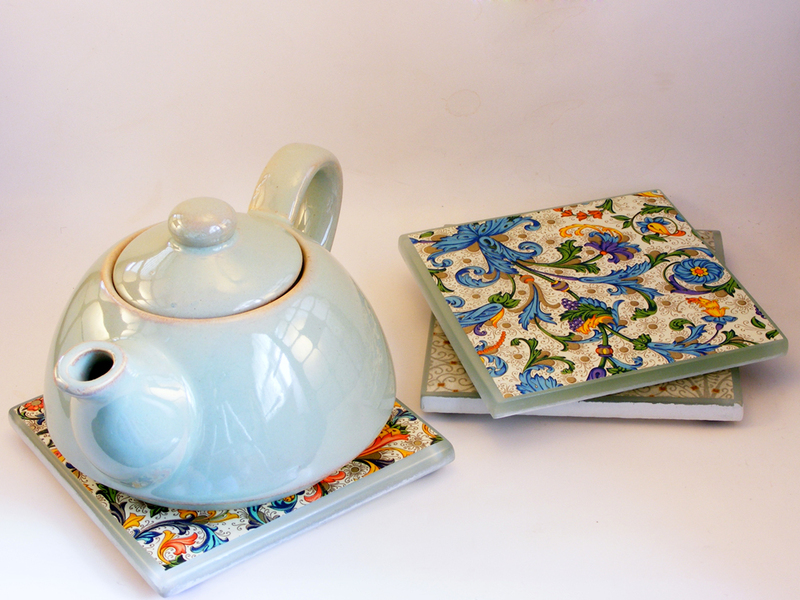 Once varnish is dry, apply bumpons to the underside of the tile. 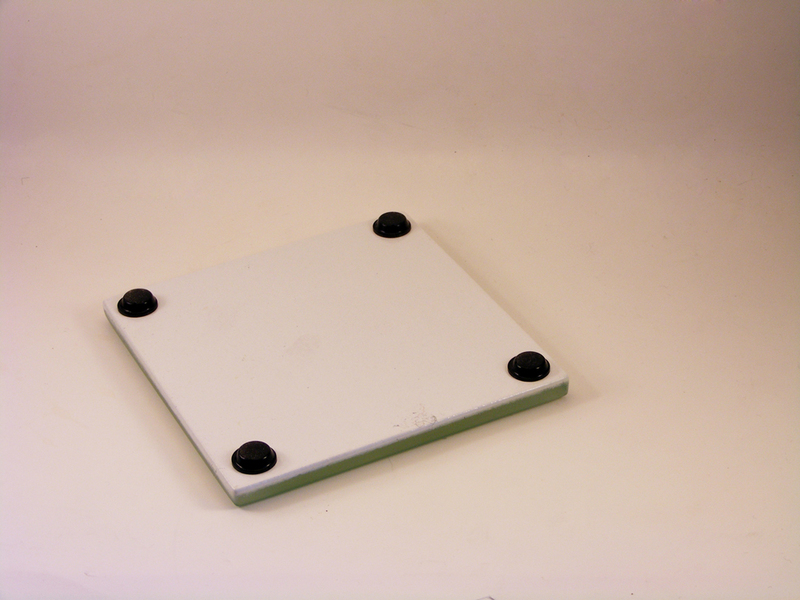 This will help the coasters stay in place and protect the table they are sitting on. You can also glue a square of felt on the bottom of the tile if you can’t find any bumpons. Allow 7 days for the varnish to completely cure before heavy use. 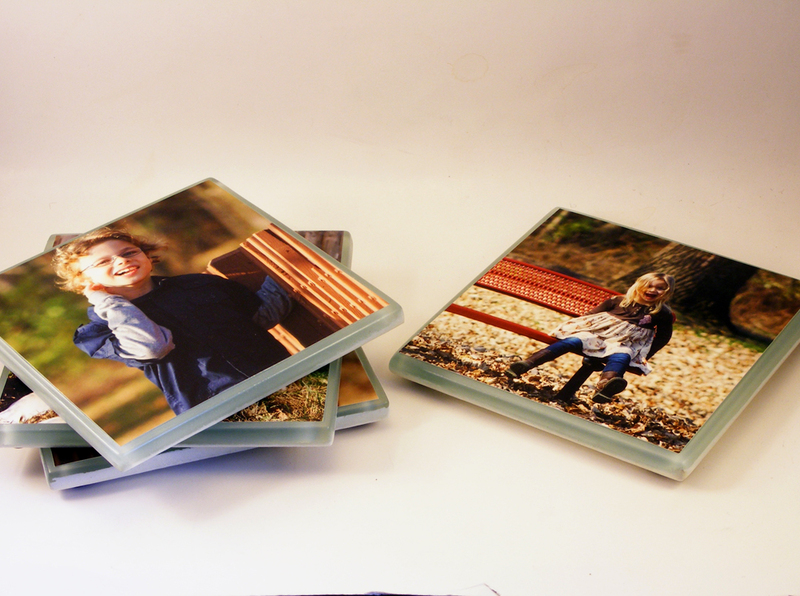 Now you have some wonderful, custom coasters to keep for yourself or hand out as gifts this season.